Skyrise Miami lost a slate of Middle East investors after a pair of Dubai-based lawyers allegedly frightened them with false claims that the proposed observation tower in downtown Miami would not get built, according to a recently filed lawsuit in Miami-Dade Circuit Court. 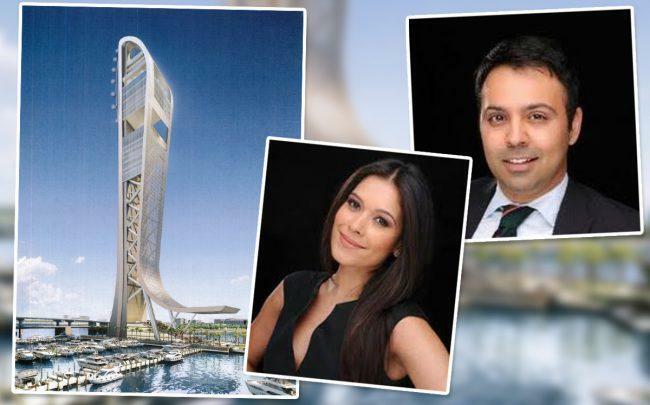 Skyrise Miami Tower Investors LLC, a project lender incorporated in Delaware, claims it paid $720,000 in commissions to Step America and its founders, Shariar Zamanian and Preeya Malik, to secure financing agreements with 14 Middle East investors, only to have the two attorneys sabotage most of the deals. Julie Feigeles, the attorney for Skyrise Miami Tower Investors, declined comment. Zamanian and Malik did not respond to email messages requesting comment. Located on waterfront land adjacent to Bayside Marketplace, Skyrise Miami is a 1,000-foot, $430 million project currently under construction. It’s the brainchild of Miami developer Jeffrey Berkowitz, who is relying on the controversial EB-5 visa program to fund more than half of the construction cost with foreign investors’ monies. The program is a vehicle that encourages foreign investment by granting permanent U.S. residency to investors (as well as their immediate family members) who create at least 10 domestic jobs and contribute at least $500,000 to $1 million in a U.S. business venture. Over the years, the program has gotten a bad rap due to instances of fraud and abuse by developers and investment fund managers. Skyrise Miami Tower Investors entered into an agreement with Step America in 2014 to pay the firm a commission fee of $45,000 for each investor that successfully contributed $500,000 to the project. Step America would also get an additional $22,500 annually for five years for every investor the firm successfully recruited. Step America had exclusive rights to market Skyrise Miami in Dubai, Abu Dhabi and Iran, the complaint states. Zamanian and Malik hooked 14 investors who gave $500,000, each, for a total of $7 million and two more that ultimately did not make investments. Skyrise Miami Investors paid commissions for all 16, resulting in Step America collecting $720,000 in fees, the suit states. In October 2018, Skyrise Miami Tower Investors notified its foreign investors that due to a change in market conditions there would be a change in the financing structure and gave them the option to back out of the project and receive refunds, according to the lawsuit. Five months later, the Skyrise lender found out that Zamanian and Malik “falsely advised investors” that the project was not proceeding as planned, that they would not get their green cards, that they would not get repaid and that all the EB-5 investors involved in Skyrise had withdrawn their commitments, according to the suit.